In 2009, the International Code Council (ICC) acknowledged that the IBC’s fire rated glass (FRG) provisions were confusing, so it appointed an ad hoc committee of fire and building officials, test agencies and industry representatives to recommend revisions. Even though the 2012 IBC does not take effect until accepted by local jurisdictions, the new Chapter 7 tables are helpful in understanding and meeting the glazing code requirements contained in the 2006 and 2009 IBC, as well as NFPA 80 outlined in the 1999 and 2007 NFPA 80 editions. Click here to see the 2012 IBC 716 Tables. You can learn more about these new tables in: Clearing Up Confusion About 60-min Fire Rated Applications. 2012 IBC Table 716.3 designates new marking for fire-rated glazing assemblies that correspond to test standard(s) to which the product was tested.Â Â Click here to download Table 716.3. For the first time, the door assembly rating table distinguishes between fire protective and fire resistive glazing. The 2012 door assembly rating table has a new column that spells out size limits for vision panels, and another column describing where FRG can and cannot be used in sidelites and transoms, and whether or not it needs to be fire resistive glass. Click here to download Table 716.5 Table. Here are a few highlights. Fire protective (e.g., ceramic, wired glass) door vision panels in 2-hour or less fire walls, exit enclosures, exit passageways, and exterior 3- and 2-hour walls are limited to no more than 100 square inches. Fire protective (e.g. ceramic, wired glass) products are prohibited in sidelite and transom assemblies in fire walls, interior and exterior 2- and 3-hour walls, and exit enclosures and exit passageway walls. Fire protective (e.g., OH-45) and some fire resistive (e.g., W-60) products are allowed in 1-hour fire barriers used as incidental use areas and mixed occupancies. Only fire resistive rated glazing assemblies tested to ASTM E-119 or UL 263 may be used in fire walls and fire barriers rated over 1-hour. Size of Fire Protective Vision Panels Now Limited to 100 sq. in. 716.5.5.1 Glazing in doors. Fire-protection-rated glazing in excess of 100 square inches (0.065 m2) is not permitted. 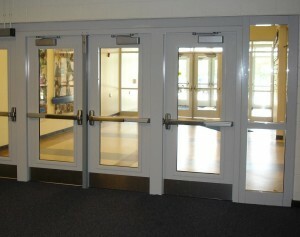 Fire resistance rated glazing in excess of 100 square inches (0.065 m2) shall be permitted in fire door assemblies when tested as components of the door assemblies, and not as glass lights, and shall have a maximum transmitted temperature rise of 450ºF (250ºC) in accordance with Section 716.5.5.